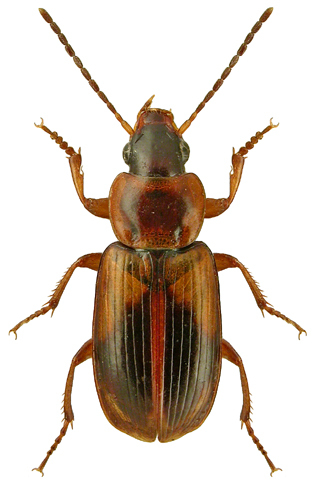 Basic colour: Head black, pronotum normally uniformally bright red-brown. Elytra black with basal third, suture and margins red brown. Pronotoum: Transverse, sides strongly rounded and hind angles indistinct; foveae almost impunctate. Habitat: Coastal saltmarshes and under coastal cliffs in wet flushes.